I remember sharing tapes with my friends in the youth. Nowadays most youngsters do not know what a magnetic tape is, they do not know how life was before the internet and the easy access to music from around the world. People are social beings and few years ago a new tape was a good reason to meet together, share tastes and exchange the tapes while spending a good time. Spotify tells you what your friends are listening to, which fills the need to socialize and the need for continuous research for new artists and songs, but in this project I suggest a new way to search and fill that need of being in touch with friends. We are using a ‘bubble hierarchy’ graphic to represent the relation between the singers you have already listened to, and the singers your friends listen to and you may like. This graphic allows you to start listening new styles and know more about its popularity. In this approach, instead of giving you an established or pre-fixed cloud with lots of items, I have decided to go counterflow. It will let you add friends and gendres and find new connections ready to add to your play list. 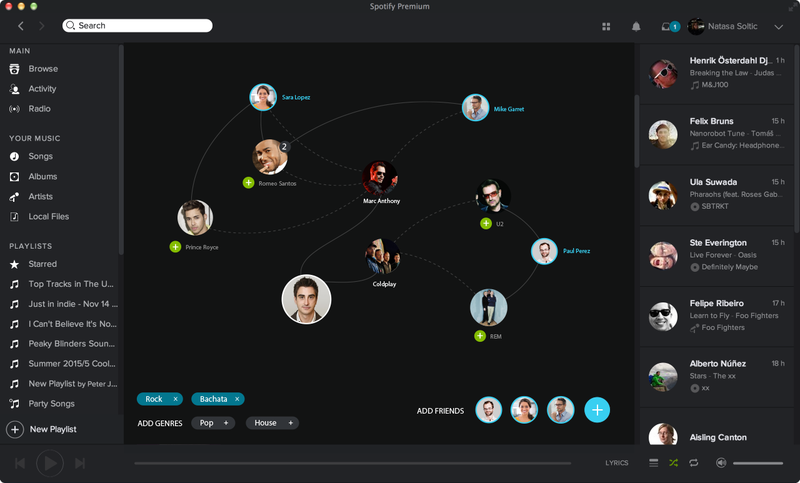 We could also encourage social communications, allowing you to suggest new artists to your friends. “Hey, Sara has recommended you a new group”. Maybe we can mimic that feeling that occurs when a friend shares a tape with you.